FStech and Retail Systems had previously announced Handpoint as shortlisted for the Compliand Project of the Year category, and last week at the 2014 Payments Award Ceremony, they announced Handpoint as the winner! The whole team at Handpoint is extremely grateful for this honour and appreciation of our work. Handpoint was recognised for its strategic and effective use of technology which enables compliance with card and payments-related regulations. With 15 years of experience in the payment market, Handpoint is constantly pioneering to develop and produce the best solution for mPOS payments. A significant achievement was when Handpoint became the first company in the world to be accredited with PCI-Point-to-Point-Encryption(P2PE) for an mPOS application, which addresses the burdens of security, compliance, and integrations for merchants obtaining mobile payments. Handpoint has focused its efforts on simplifying the integration process across the differing platforms, to ensure its highly secure payment solution can be easily yet efficiently deployed through Handpoint’s simple-to-integrate APIs. 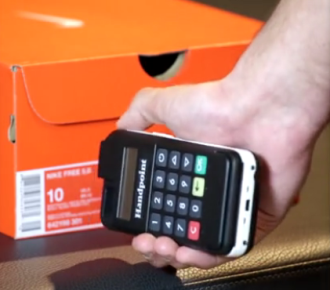 Early adopters have already been taking advantage of this advanced mPOS technology, by transforming their store with Handpoint’s highly secure payment solution; heightening customer interaction and sales. See this excellent case study, which captures this system in action.